We were treated to a talk and slides from one of our members on the subject of My Experiences on e-bay. This was an entertaining and witty talk which dealt with some of the odder items she has sold on e-bay on behalf of Millstream Animal Shelter. One of the strangest items was an artificial leg, including shoe, from the 1930's which was sold to a medical museum in London, who wrote to say how thrilled they were to get it and it now had it's own display case in the Museum. This was our AGM and Hotpot Supper. The evening commenced with a stirring rendition of Jerusalem before we settled down to AGM business. We elected our new Committee - 8 members who volunteered to serve on the Committee and were elected unopposed. Social time and hotpot followed. We celebrated our 3rd Birthday with an evening of Desert Island Discs. What a FABulous night. Doreen, our new President ( and ex Brass Band Member ), started the evening with her choice of a rousing Brass Band March- Slaidburn. Glenys told us of what befell her when she met her prospective in-laws for the first time and she went to see GI Blues at the cinema, so her choice was "Wooden Heart." Sue chose "Ferry Cross the Mersey" as she had had her 15 minutes of fame when she was the 500th visitor to Liverpool Maritime Museum and was treated to a VIP day with the Mayor and other dignitaries. Mia chose a ballad from VNV Nation. When she discovered her new boyfriend liked this song she realised he had a soul - he is now her partner. Joan chose an aria from Carmen as it reminded her of how as a 12 year old she heard it for the first time on her parent's stereogram and mimed and acted along to it and how it had developed into a lifelong love of opera for her. Chris chose " When an old cricketer leaves the crease" - an elegy of a fabled England, loss, and Cricket. Linden chose " Nymphs and Shepherds". You never hear it played nowadays. Why should so-called progress always mean calling anything older unfashionable, and discarding it out of hand? Jane chose "Maggie May" as it was popular at the time when she discovered her independance on going to College - and also discovered that by climbing in through a friend's window she could circumvent the 11pm Hall of Residence curfew anytime she liked. Brenda chose "Doo Wah Diddy" as it was always on the jukebox when she was 16 and working in the coffee bar at Butlins, Margate. A co-worker who looked like a Greek God would wave to her everytime it was played. And, reader, she married him. Carole related a tale of meeting Gerry Marsden when he was playing at Oldham and getting to kiss him. She then had the whole of FAB WI singing and waving along to her chosen song which she had sung in karaoke in a Manchester Pub on her 40th. By the end of that evening, she even got hard Manc lads singing along to it. It was, of course, "You'll Never Walk Alone" . Helen finished with her choice- an English tune chosen by the Womens Institute after the Great War. What else could it be than "Jerusalem". It was sung by all present. The enjoyable evening was rounded off with cutting our 3rd Birthday cake and a suitable 3rd Birthday game of Pass the Parcel. Speaker Pauline Saxon gave us an informative talk on " The Romans", their history and customs- and plumbing. We held an enjoyable Games Night with a Beetle Drive and fun quiz about the 1950's. 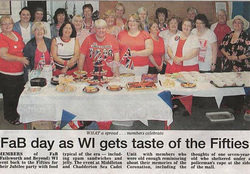 On 2 June 2012 FAB WI threw their own Street Party at he Sea Cadet Unit to celebrate the Diamond Jubilee of HM Queen Elizabeth. A good spread was laid out, including spam sandwiches, cakes and jellies. The event was featured in the Oldham Chronicle. 4 June 2012 FAB WI at the Queen's Jubilee Beacon at St John's Church, Failsworth. 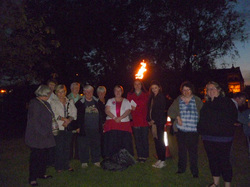 Several members of FAB WI went to St John's Church, for the lighting of the Queen's Jubilee Beacon in Failswoth. Following a hot pot and short Church Service the Beacon was lit in the Churchyard. FAB WI held an Olympics Night with a competition comprising a variety of sports, including Darts , egg and spoon race, etc. The teams were arranged in countries and each team contributed typical food from that country to a Buffet.